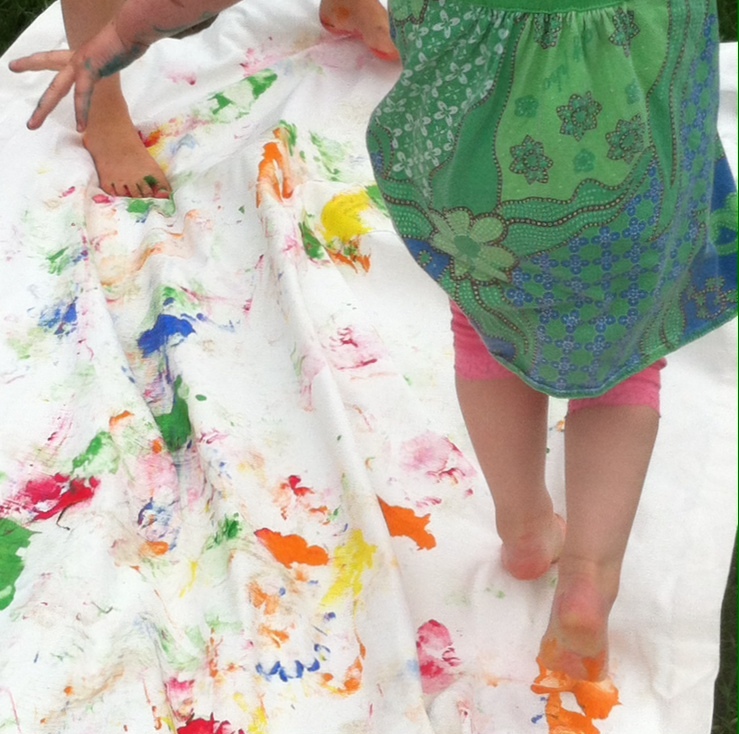 People of all ages are invited to paint with their feet while moving and/or dancing across a large piece of fabric. We’ll experiment with a range of strategies for creating foot painted artwork that includes everything from a movement free-for-all to a game of “Simon Says”. Play for a few minutes, or stay for the whole afternoon. Come from an interest in: using dance to connect people to one another and their community spaces. I want participants to feel playful, connected to one another, and validated by their contribution to the collaborative artwork. Might remind you of: finger painting, but on a much larger scale and done collaboratively. Might be a good fit if you’re looking for: a fun, easy and creative activity appropriate for all ages– from toddlers to grandparents; a way to get out of the house for a while to play, while leaving the mess behind! We’ll have water to clean off paint. Come with a group or on your own.